Location Great South Strip location next door to NYNY and over the road from the West Wing entrance to MGM Grand. At time of writing there is a large building project going on to the North of Monte Carlo. Theme Themed on the Mediterranean Rivera principality of the same name. The theme only runs as far as the door and then it all ends. It’s just another casino with a low ceiling and a few candelabras. I can not believe that the interior designers of this casino have ever been to Monte Carlo!! Rooms The rooms are standard sized and have lovely furniture and fittings, they are meant to look European and they do look classy, these rooms are excellent value for the quality. Attractions I have to be honest past the external architecture not much in fact nothing that I can really think of ummm. Pool The pool is great with a lazy river and machine to create 10 foot waves. Because of the lack of attractions this means not many families stay at the Monte Carlo so the pool does not tend to get too crowded or have many kids in it. Shows and Entertainment Lance Burton probably the first modern master magician has been the main attraction at the Monte Carlo for years, the show is meant to be one of the best magic shows in Vegas if not the World and is very highly recommended. Monte Carlo also have guest performers in their theatre. Dining We eat at the food court and this was probably the worst service of any that I have experienced in Las Vegas. There is a buffet (B: $11.95 L: $13.95 D: $18.95 and champagne brunch $18.95) I have not eaten here but the reviews give it a fair marking. There are a handful of up market restaurants and a highly acclaimed Micro brewery. A new and exciting Mexican called Diablo has opened that is meant to be very good indeed. Gaming 90,000 sq ft of gaming space brightly lit, gold and sparkly and not my favorite on the Strip, I actually think that this area has been reduced in size as more restaurants are added. There are 2,200 machines from a nickel upwards with a fair amount of nickels dotted around. There are about 70- tables and 10 roulette wheels. In Europe there is only one zero on the roulette wheel but in the US there is zero and double zero thus doubling the house's edge. In a Monte Carlo themed casino surely the single zero applies right? Unfortunately not, they have one or two high stake wheels with single zeros and the rest good old American ones. The casino seems very serious to me, quiet and even cold; some people I guess prefer to play in this atmosphere. Drinks service I got served quite quickly the first time. After that even when I had been served I seemed to wait ages between placing my order and receiving my drink. 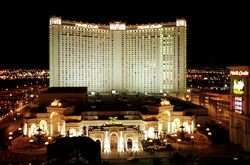 Overall A luxurious casino with a fairly good Strip location; aimed at more sophisticated, slightly older and well-heeled patrons who like to gamble in a quiet atmosphere. Good points If you like it, in a place where all of the casinos seem to be frantic, Monte Carlo seems calmer, more clinical and better organized. Bad points It’s too quiet, I guess this may appeal to some people and whilst I don’t like really noisy places this too quiet for me.